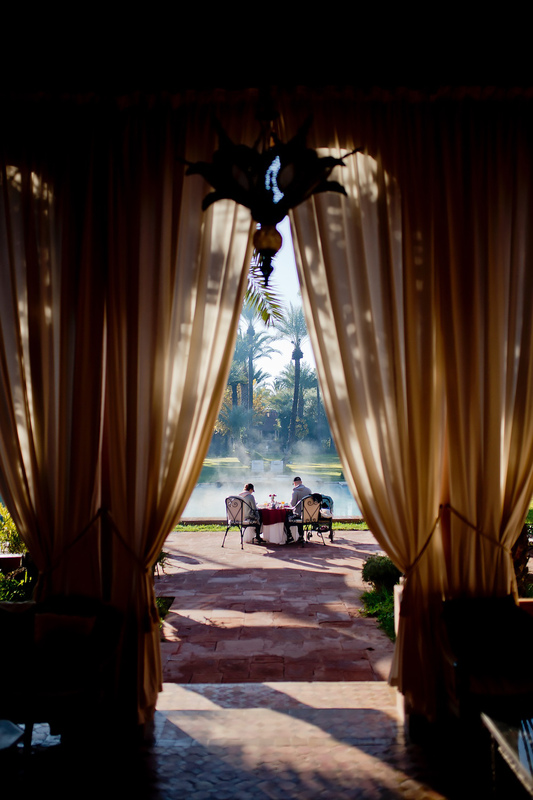 Marrakesh – a dream from 1000 and a night. How often am I asked about our girls trip to Marrakesh? For 5 days we lived in our own oriental fairy tale. The mix of city trip and relaxation was perfect. The crowning finale was our stay at the Dar Ayniwen Garden Hotel & Bird Zoo. More Morocco/Marrakesh travel recommendations? 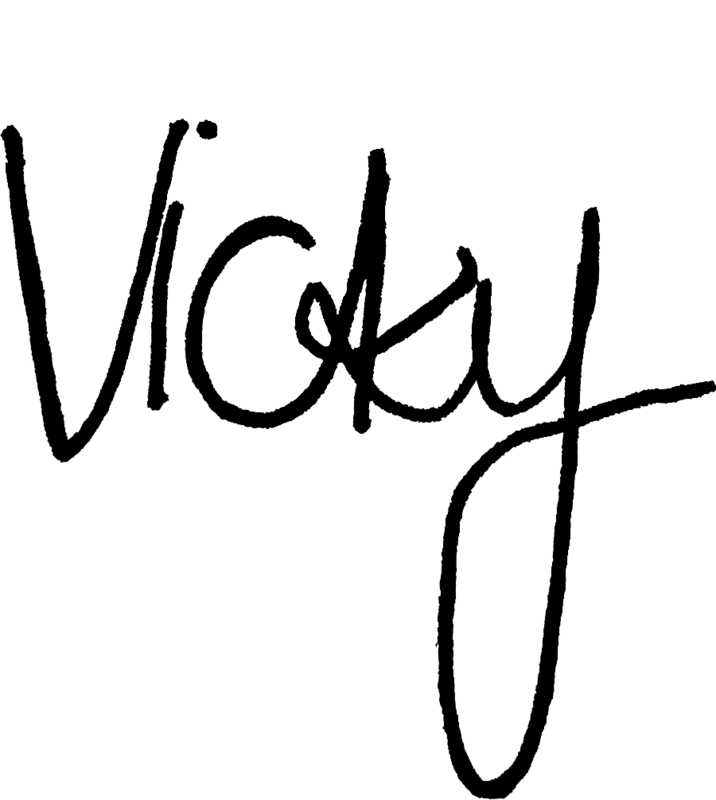 This way! After a night under the stars we drove back to Marrakesh at noon. 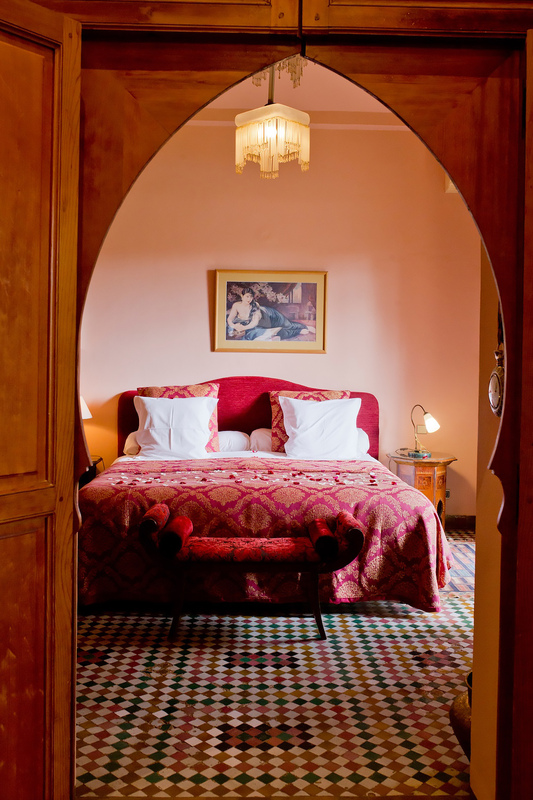 For the last two nights we deliberately chose a quiet hotel outside the Medina (old town of Marrakesh). 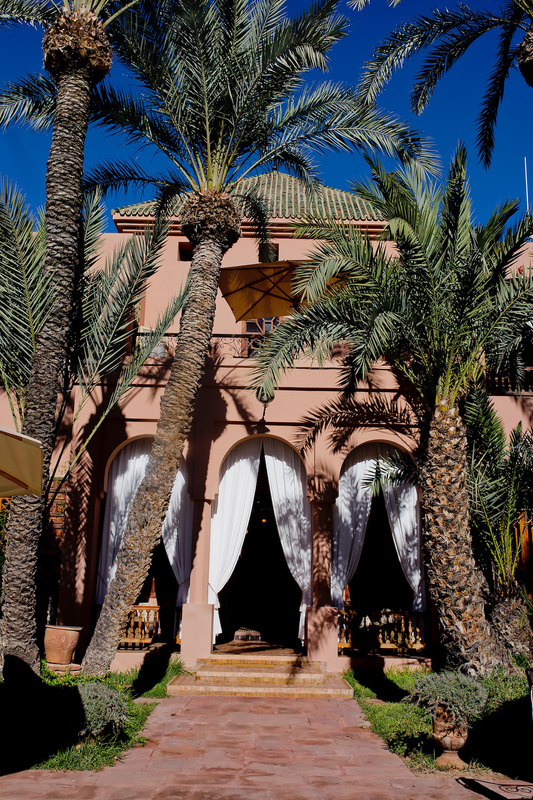 The Dar Ayniwen, well hidden in the palm oasis Palmeraie about ten minutes outside the medina, was the right retreat. A bumpy inconspicuous road past the famous palm oasis and dromedaries led us to Dar Ayniwen. 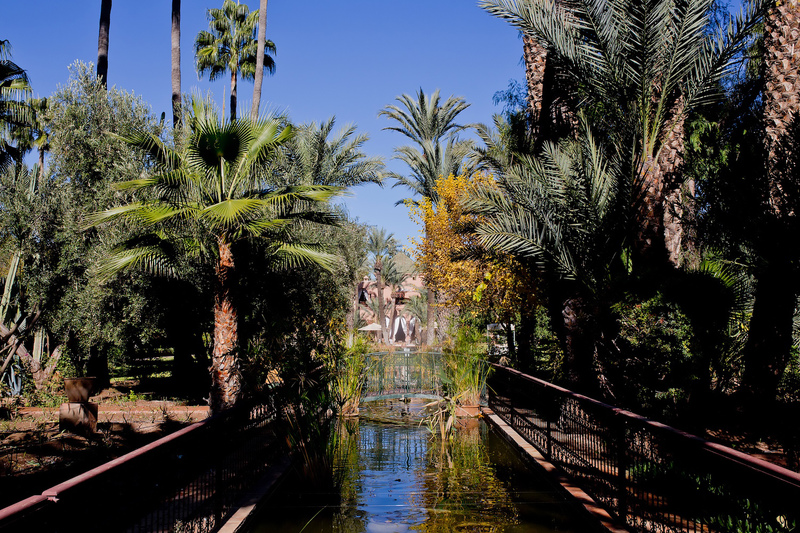 “Ayniwen” means palm tree in Berber language. 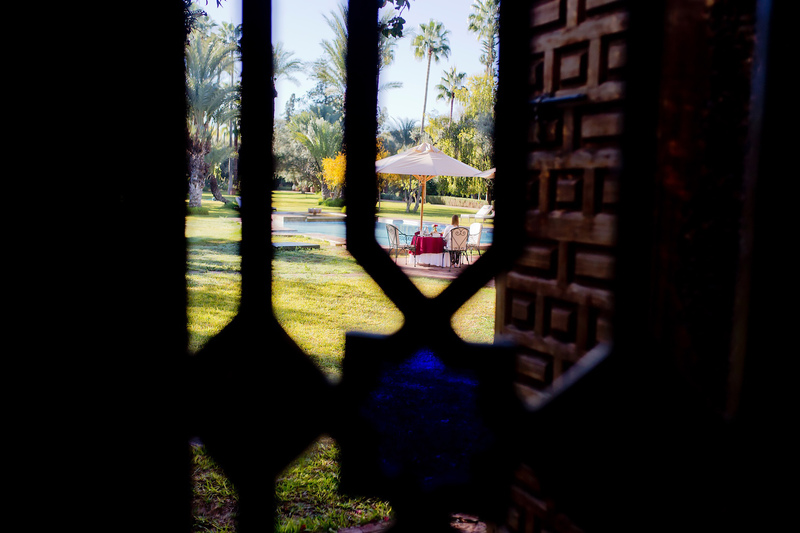 Behind a big gate we reached the oasis of owner Stéphane Abtan, who realized his dream of his own garden a few decades ago. Between 1980 and 1982 he not only built the family house, but as a bird lover also his own bird park in the middle of the two hectare property. From the spacious entrance we walked right along the villa to the main entrance of the main house. This led over a narrow path through the tropical enchanted garden. Through the heavy entrance door we enter the main house from the 19th century, which has remained unchanged until today. Here in my Instagram Story you can take a picture of the fantastic entrance to the villa. On the first day we immediately used the free shuttle service into the medina and went shopping for another hour. The rest of the afternoon we spent at the pool with the wonderful temperatures (23° Celsius in November!). In the evening the Dar Ayniwen drove us into the city again. We toasted one last time on the Terasse des Épices. 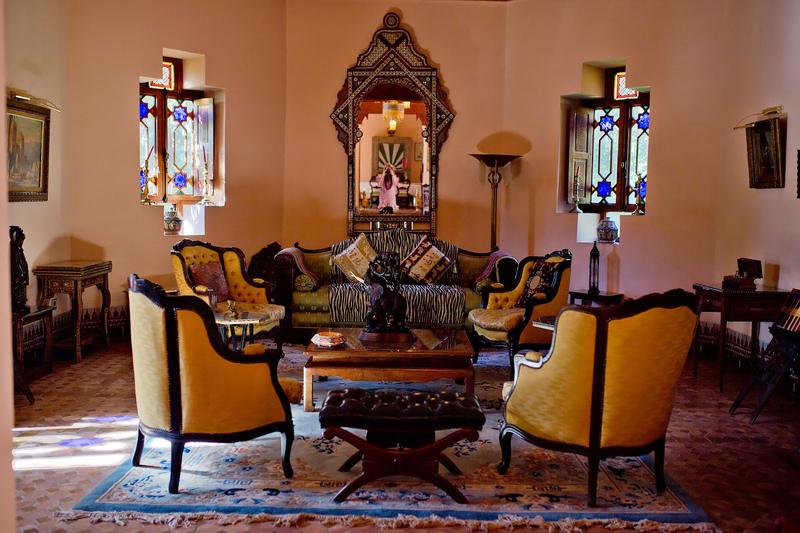 For hotel guests staying at Dar Ayniwen for more than four nights, they also offer a free transfer from/to the airport. 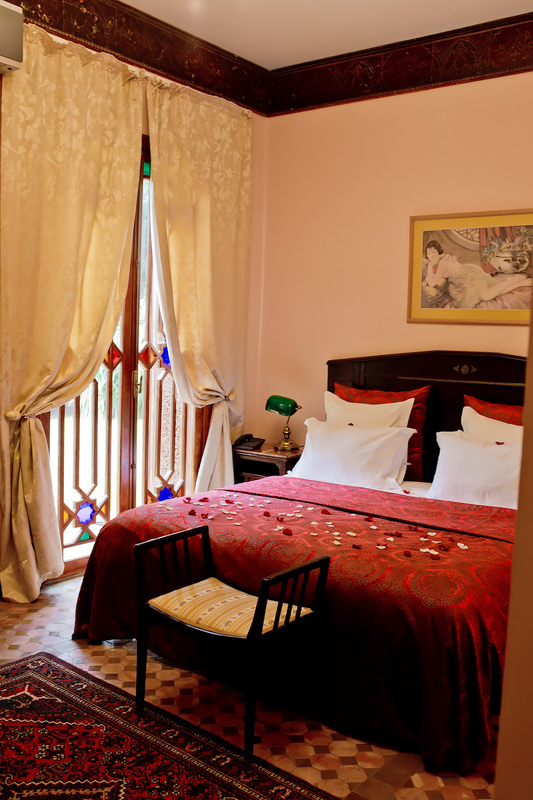 Stéphane’s assistant Aziz accompanied us to our nocturnal room, the Sheherazade Suite. 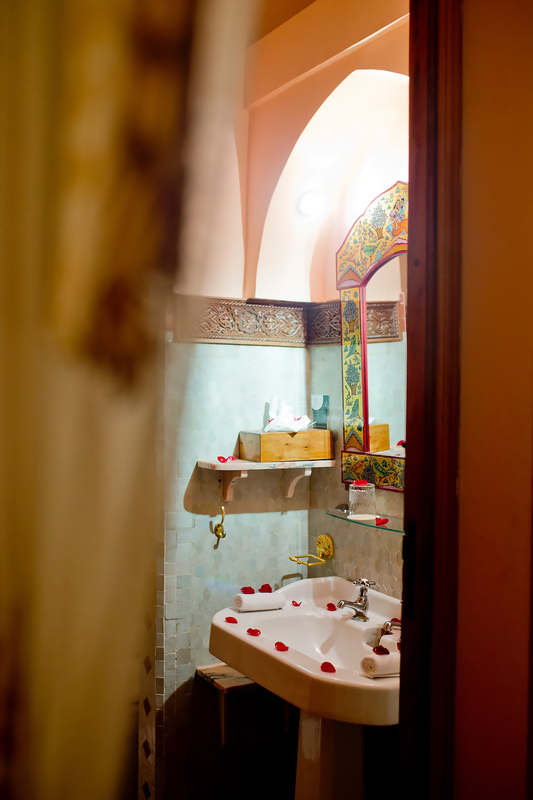 He proudly told us that the Italian actress Monica Bellucci often spent the night here. She loved the view out onto the steaming pool in the garden in the morning. We also had this pleasure – it was beautiful. 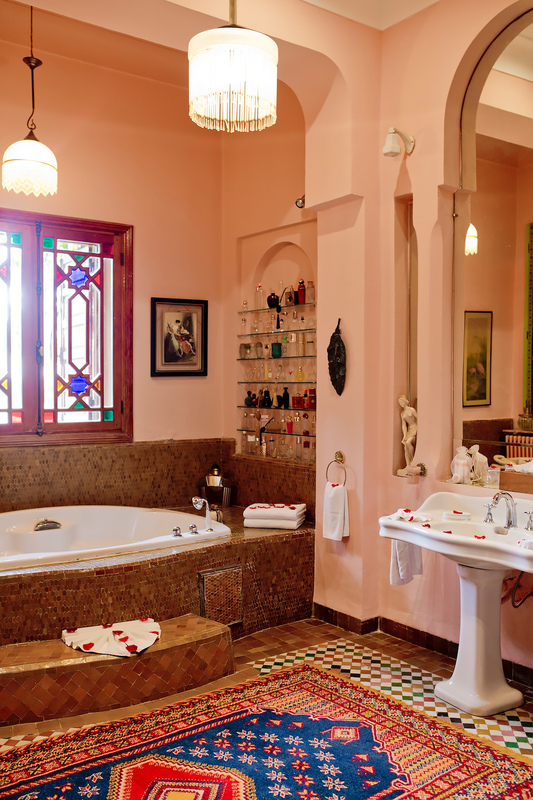 The Sheherazade Suite is a 40 m² romantic suite, furnished with fine fabrics, beautiful mosaic floors and antique furniture. Truly a dream of a thousand and one nights. It also contains an impressive collection of perfume bottles. This reminded me of my childhood because we also had a small collection of oversized bottles in our bathroom. 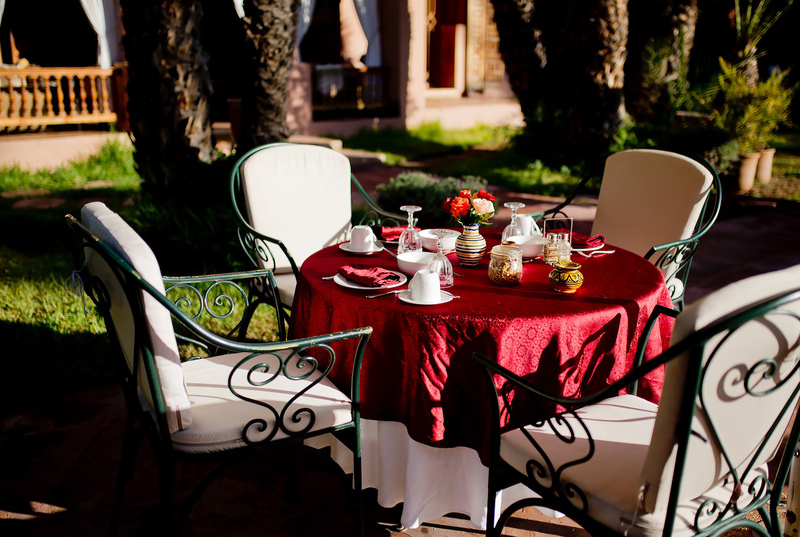 The Dar Ayniwen offers 10 elegant rooms and suites. 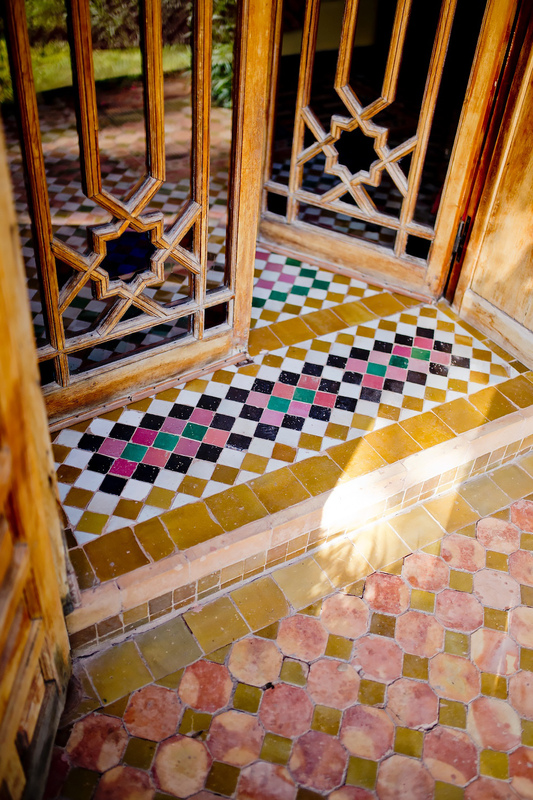 In the main house I can also recommend the Room Adjig, which also has a private exit into the tropical garden. It’s best to book directly with the owner. This is common in Morocco and you always get the best price there. Our stay in November couldn’t have been better. Early in the morning it was still a bit fresh, but this made the view to the steaming pool even more beautiful. 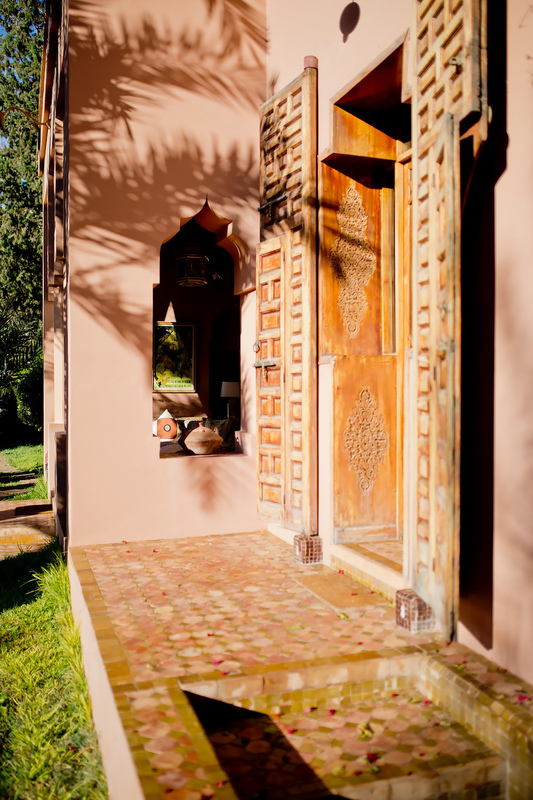 A classic Moroccan breakfast is served here, as well as lunch on request. During the warm summer nights, one can also dine here. On our first evening we did not drive again into the old town of Marrakesh. 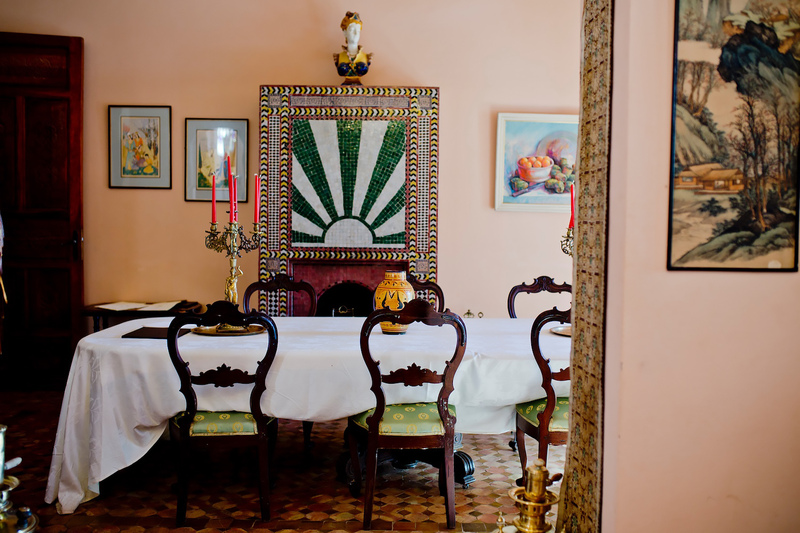 Morocco experts know anyway that the best place to eat is at home with the Moroccans. That’s why we had pre-ordered a relaxed dinner. 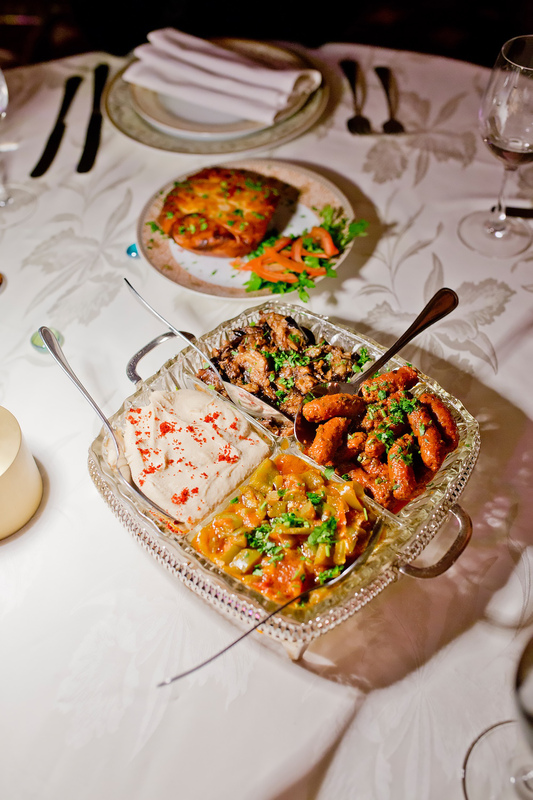 In Dar Ayniwen you can choose between different cold and warm Moroccan starters, for example an “Assortiment de 4 Salades” with for example Tektouka, Hummus, Zaalouk or Merguez Épicées (spiced minced meat sausage). Always delicious Moroccan pastillas are highly recommended. 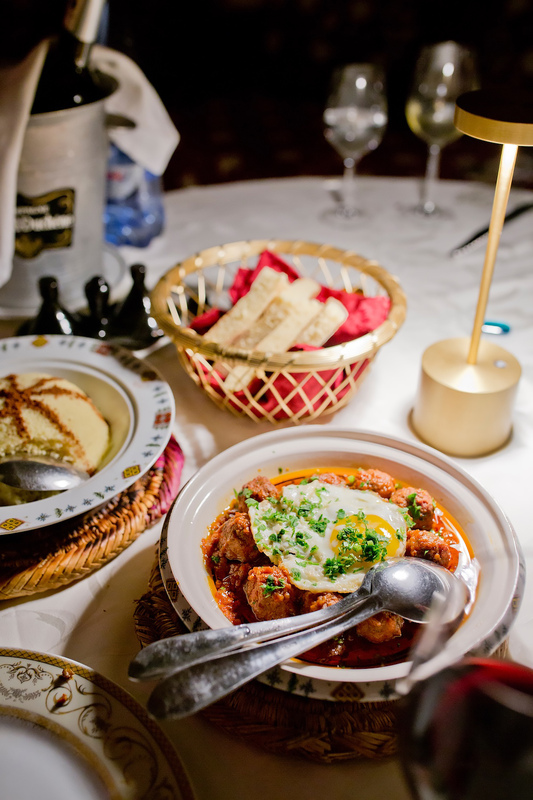 The main courses at Dar Ayniwen are a selection of traditional tajines with fish, beef or vegetables. Herefor, they always serve couscous. 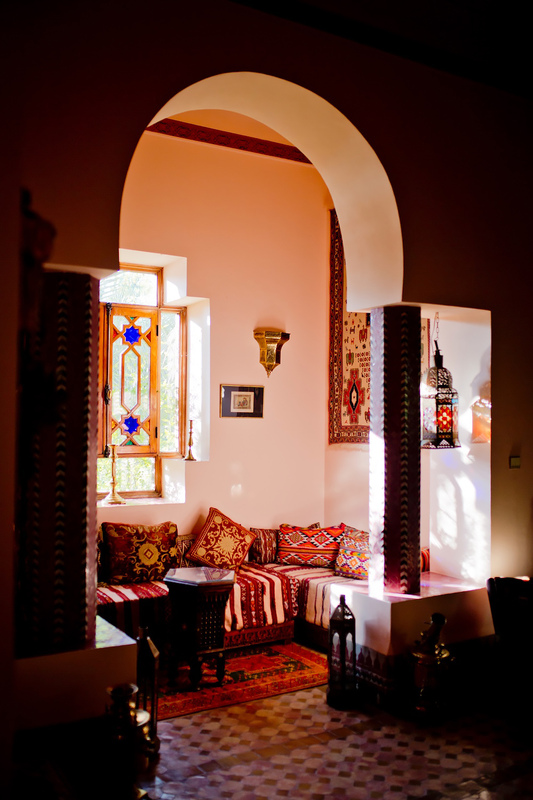 The food was very tasty and as Moroccan cuisine is – very sumptuous. 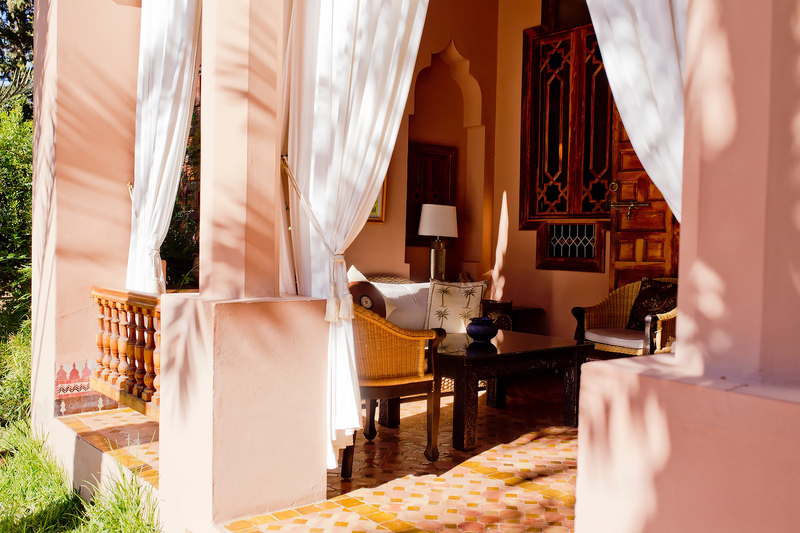 The staff at Dar Ayniwen is very friendly and courteous, as we were used to from Moroccans in general. Recommendation: I saw that you can also book a Welcome Dinner for 35€ / person. And so our unforgettable stay in this beautiful oasis flew by. We will definitely come back. A warm shukran ! to Stéphane and his assistant Aziz, who always helped us politely.